Auction of Historic Arms & Militaria Features Objects from the Collection of Fort Ticonderoga | Skinner Inc.
MARLBOROUGH, MA – October 14, 2014 – Skinner, Inc. will hold an auction of Historic Arms & Militaria on November 1, 2014 at 10 AM in Marlborough, in conjunction with a Clocks, Watches & Scientific Instruments auction. Skinner continues to expand its offerings of militaria and is pleased to present arms from the collection of Fort Ticonderoga. A Clocks, Instruments & Militaria – Online auction will also be open for bidding from October 28th through November 4th, 2014. A variety of eagle-pommel swords and Confederate polearms from the collection of Fort Ticonderoga will be presented at auction. The preservation and reconstruction of Fort Ticonderoga was one of the earliest historic preservation projects begun in North America, and these arms have been in the collection since the association was established in 1931. 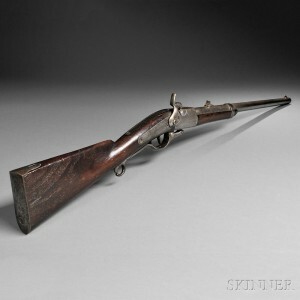 The auction also features pistols and muskets, including rare Confederate carbines, historic documents, and antique arms from the American Revolution through World War II. A French & Indian War powder horn from the 1750s evokes an important moment in early American history with its inscription: “By Powder & Ball / The French Shall Fall / Rufus Hill” (Lot 101, estimate $4,000 to $6,000). Rufus Hill was from Stonington, Connecticut, and served in the militia at various times during the conflict. An Ames presentation sword from 1848 commemorates the “gentlemanly conduct” of Sergeant John P. Reed (Lot 80, estimate $3,000 to $5,000). 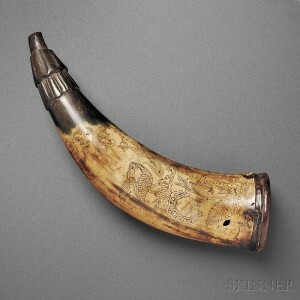 The silver grip is beautifully engraved with a panoply of arms on one side and an eagle on the other. Confederate carbines are a rare find, and this auction includes several exceptional examples, highlighted by a Keen, Walker and Company “Perry” carbine (Lot 159, estimate $10,000 to $15,000) and a Bilharz, Hall and Company “Rising Breech” carbine (Lot 164, estimate $20,000 to $30,000). A selection of historic documents will be offered, including the Revolutionary War documents of Reverend Hezekiah Smith, who went on to help establish Brown University. The group of documents includes a commission signed by John Hancock and an invitation to dine with General George Washington (Lot 103, estimate $4,000 to $6,000). Over 350 lots of clocks, scientific instruments, and militaria will be offered online, beginning on October 28, 2014 at 10:00 AM. Lots will begin to close on November 4, 2014 at 4:00 PM. Bidders can participate at any time during the eight-day auction from the comfort and convenience of home, and have the added value of previewing the online-only lots in person during the regular Marlborough preview hours. Previews for the auction will be held on Thursday, October 30, from noon to 5 PM, Friday, October 31, from noon to 7 PM., and Saturday, November 1, from 8 AM to 9:30 AM. All are welcome to attend a reception and gallery walk with Robert C. Cheney, Director of Clocks, Watches & Scientific Instruments, on Friday, October 31 starting at 5 PM. An illustrated catalog for Historic Arms & Militaria and a separate catalog for Clocks, Watches & Scientific Instruments are available from the Subscription Department, at 508-970-3240, or from the Gallery. Prices realized will be available online at www.skinnerinc.com, both during and after the sale. The Skinner website enables users to view every lot in the auctions, leave bids, order catalogs and bid live, in real-time, through SkinnerLive! This entry was posted in News and tagged antique arms, carbines, Civil War, Confederate, eagle pommel sword, firearms, Fort Ticonderoga, historic documents, Joel Bohy, Militaria, muskets, pistols, polearms, swords, WWI, WWII by Skinner. Bookmark the permalink.